A content management system (CMS) is a software platform that helps businesses track, distribute and control documents and files. Software Advice surveyed employees at companies that use a CMS on a daily basis to learn which applications are most useful, which present challenges and how using a CMS has improved business operations. The resulting insights will help buyers understand what they should look for when evaluating a new CMS. A majority of respondents rate their CMS as “very important” in overcoming content-related business challenges, such as distributing documents and tracking changes. The three CMS applications employees use most frequently are document distribution, reporting/analytics and content capture. Reporting and analytics functionality is used daily by 63 percent of companies with over 1,000 employees, but by only 47 percent of companies with fewer than 1,000 employees. Nearly half (48 percent) of respondents report “moderate to major” difficulty integrating their CMS with other systems, while 37 percent say the same about customizing their CMS system. Before the rise of the Internet in the 1990s, content management systems were easily categorized as a single type of software with a relatively singular scope. But once businesses began to focus on online content (particularly, content meant for public consumption), the definition of CMS began to blur. 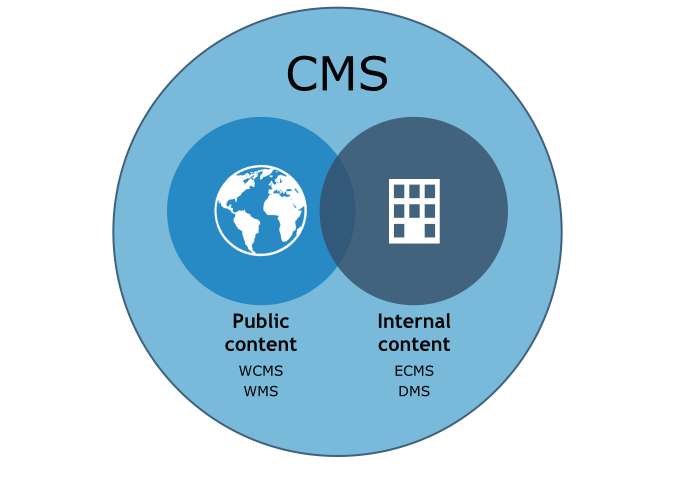 Today, we see two systems that share the CMS name but that manage two generally different types of content: Those that manage public, online content and those that handle offline, private content. There is some overlap, however, as some CMSs manage both types. A system used for managing online, public content is generally called a “Web content management system,” or WCMS (or just WMS). These manage outward-facing content, i.e., content that will be viewed by the general public or by customers. WCMSs are akin to online publishing tools: They simplify the process of uploading content and formatting it correctly so it looks good online, without requiring knowledge of HTML or other Web programming languages. There is a wide variety of CMS platforms on the market, which differ substantially in the depth and breadth of their functionality. These include such products as Alfresco, PolicyTech, Content Central and IBM’s ECM. Additionally, there are some industry-specific CMSs—such as Aconex, for managing content and documents in the construction industry—and some that are size-specific, such as DocSavy, which is designed for small and midsize businesses (SMBs). Records management Organize, distribute, track changes and manage permissions of company records. Contract management Track and automate transactional content, such as commercial contracts and customer forms. Case management Create documents for a business process, such as a claim, proposal, request or complaint. Business process management Track documents for businesses with a high volume of content. Digital asset management Enable management of digital media, often focusing on content such as videos and photos. Reporting & analytics Identify valuable insights from a company’s collective content. Document capture & image processing Convert printed documents and images into digital formats. 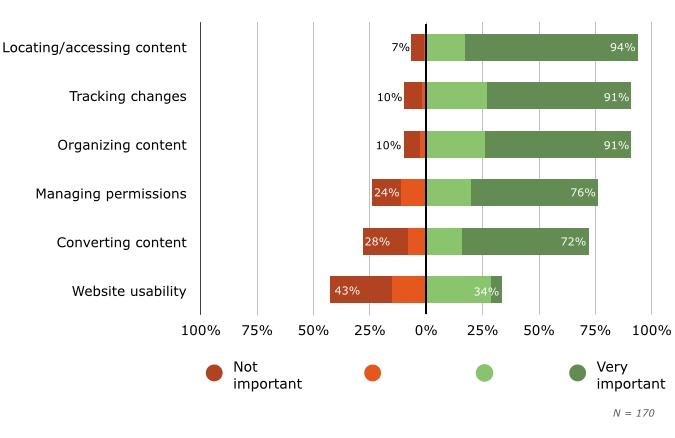 Our survey finds that content management systems perform these functions very effectively for the users in our sample. A majority of respondents rate their CMS as “very important” in helping them overcome a number of common business challenges (from a list we provided them). When it comes to locating and accessing content (the business challenge users rate CMSs as most helpful in overcoming), one respondent praises the “search accuracy and speed” of their CMS platform. Indeed, the search engines included with many content management systems are very advanced—much more so than the simple search engines of most computer operating systems (OSs), such as Finder in Apple’s OS. CMS searches can include a wider variety of variables, such as when a document was last accessed, by whom and for what reason. In companies that lack a dedicated CMS, employees often rely on the relatively weak and limited search capabilities of whatever their computer’s OS provides. One of the primary goals of a CMS is to enable employees to work more efficiently by saving time when they need to search for the right content. This survey data shows that CMSs can very effectively meet this goal. According to respondents, tracking changes to and the organization of documents are the second and third most important functions of CMS software, respectively. Interestingly, this finding holds true for all business sizes. Indeed, business size has little bearing on how those in our sample rate their CMS for solving specific challenges. This data shows potential CMS buyers which applications other companies use most often—suggesting how integral a CMS can become in daily workflow processes. Document distribution is used most frequently, with 56 percent of respondents saying they use it at least once daily. Reporting and analytics CMS applications come in second, with 54 percent of respondents using them once or more daily. 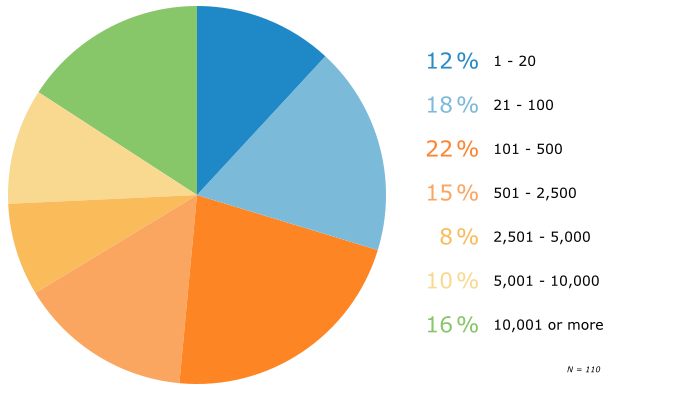 Looking at the data more closely, we find that document distribution is used daily across the board. There are no significant variables that affect this frequency of use; it’s common in businesses of all sizes and industries. In contrast to this, we find that businesses with over 1,000 employees are considerably more likely to use reporting and analytics functionality on a daily basis than businesses with fewer than 1,000 employees. However, this doesn’t necessarily suggest that smaller businesses have less of a need for the reporting and analytics functionality of CMS software. Rather, they simply may not have the resources necessary to utilize it properly. To learn more, we turn to Thomas DeMeo, vice president of product management at Alfresco, one of the most popular and quickly growing content management systems. “Actually, small organizations can often take even greater advantage of reporting and analytics functions than enterprises. They’re ... much less likely to have extra employees to analyze content usage and look for problems or bottlenecks in workflow processes. Reporting and analytics applications can show them where they need to focus their [more limited] resources,” he says. People. 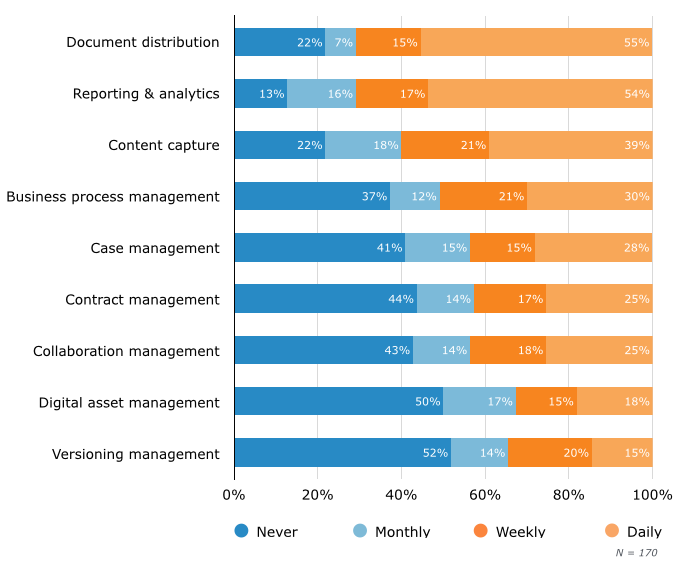 CMS reporting and analytics capabilities can show very quickly which employees access content most often, which are the most productive in terms of adding to and improving content and which might not be pulling their weight. Content. CMS applications can also reveal which content is most valuable, and to which customers. For example, a marketing department may have dozens of white papers, yet only a few of them actively bring in conversions. Processes. Companies produce content through the collaboration of many employees, often across multiple departments. Analytics applications help identify inefficiencies or bottlenecks in the collaboration process, which the company can then focus on improving. They might show, for example, that the marketing department’s review process often holds up the production of customer service materials. The use of any software system can present challenges, and content management systems are no exception. We asked our survey sample about the common challenges they face using their CMS; they identify integrations, training and customizations as the three most challenging areas. Since CMS users identify these three areas as the most challenging, we will provide some best practices (and example scenarios) that can help others minimize any problems these areas may create. Identify all other software and systems that utilize/interact with content. While company content is managed by a CMS, there are often many other software platforms and tools that need to access and use that content. CMS buyers must identify these other platforms and tools, determine how each uses and accesses content and then plan for integration before committing to a new CMS purchase. Example: A company may use a customer relationship management (CRM) platform to track communications with customers and send out individualized marketing content. However, the marketing content is all managed in a CMS. A successful CMS integration will allow it to work together with the CRM; for example, the CMS might provide the CRM with very specific content based on criteria for individual customers. Avoid using too many task-focused CMS applications. These are applications that focus on a single content-related task, performing it in isolation from other content operations. While task-focused applications are often the easiest to implement, they can create many problems when they eventually require integration with a CMS, with other task-focused applications or with other software systems. Example: A company may have many employees who need to access and make changes to the same body of content. It chooses a task-focused cloud storage application, such as Dropbox, to store all the content. While this solution does give all employees access to the content, it does only that. When the company tries to adopt a full-featured CMS, its isolated, task-focused applications could hinder implementation. Clearly identify all existing content workflow processes. Before committing to a new CMS, a company should identify all workflow processes that will be impacted by the new system. Each change that a CMS requires to the tasks employees commonly perform will likely require specific training. Example: A company’s IT director chooses a new CMS that will be used daily by the company’s 200 employees. However, the IT director is unaware of the workflow processes the new CMS will impact. As a result, implementing the CMS causes many disruptions and delays, and the company has to arrange for much more training than anticipated. Prioritize end-user usability. While a CMS can greatly increase the efficiency of operations and improve the quality of content, it will not bring these benefits if employees find ways to work around it. This problem arises when CMS training fails to overcome basic usability problems employees encounter. Example: A company chooses a CMS with much more functionality than needed. Because it’s so advanced, the CMS in question has many buttons and options on the interfaces employees interact with. Despite efforts to train employees how to best use the new CMS, many find it too cumbersome, and so revert to their old ways of working with content. Identify all file/data formats the CMS will manage. CMSs have no difficulty handling the vast majority of standard file formats (e.g., .doc, .txt, .xls and .bin). But if a company uses uncommon or proprietary file formats for some of its content or data, then any CMS it uses will need to be customized to correctly handle those formats. Example: A company may have its own format for files that store customer information. This information is frequently accessed and changed by employees, and a CMS is purchased to improve these processes. The CMS will need certain customizations to work effectively with the company’s files. Assessing the feasibility of the customizations should happen pre-purchase in order to avoid costly, unnecessary or ineffective customizations. Choose a CMS with the right degree of flexibility. All CMSs can be customized to some degree, and some to very high degrees. Application programming interfaces (APIs), included with some CMSs, allow for almost unlimited integrations and customizations. However, businesses with few special requirements might find that a less customizable CMS is a better fit. Example: A company uses atypical file formats for its content and chooses a CMS with an API, thinking it will be needed to customize the system to handle all formats. This choice could end up being unnecessarily expensive or complicated, and it’s fully possible there are other CMSs that could handle the atypical file formats with no customization. It’s clear from this survey data that content management systems are a very effective tool in the modern workplace. 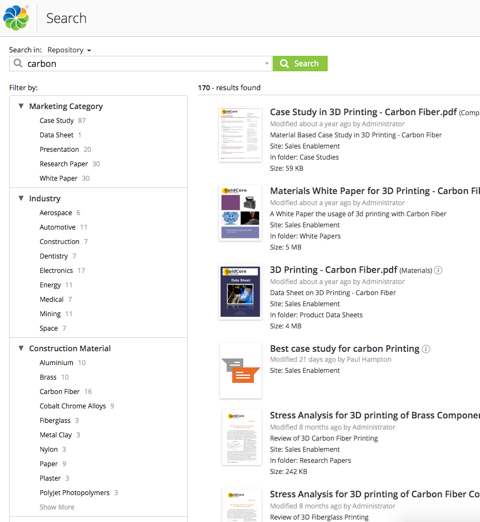 They are described by users, referring to a wide range of document and content management processes, as “very important.” While they do also present challenges—the three most common being with integrations, training and customization—these can be minimized by pre-purchase planning and by careful research of available CMS options. To collect the data in this report, we conducted an online survey of 110 full-time employees of U.S. businesses who use content management systems on a daily basis. We asked a total of 19 questions. All survey questionnaires undergo an internal peer review process to ensure clarity in wording. Results are representative of our survey sample, not necessarily the population as a whole. User commentary solely represents the views of individuals. Chart values are rounded to the nearest whole number.